Trinity College began in 1839 when Methodist and Quaker farm families in Randolph County joined together to start a subscription school named Union Institute. When the school's first principal, Brantley York, moved on to other church-related tasks in 1842, his young assistant, Braxton Craven, assumed the responsibility for the school. For the following four decades, Craven waged an unceasing effort to keep the school alive. Craven's chief challenge was to find financial support, and in 1849 he turned to the state for a recharter of the school as Normal College, with teacher training as its prime mission. Financial support continued to be scarce, however, and in 1859 Craven sought support from the North Carolina Methodists. Under Methodist sponsorship, the college changed its name to Trinity College and adopted a liberal arts curriculum. Though financial difficulties remained, enrollment grew and the college managed to survive the Civil War and Reconstruction without closing. Craven's death in 1882 after 40 years of leadership brought more uncertainty to Trinity College, but the intervention and leadership of three well-to-do Methodist businessmen-J. W. Alspaugh, Julian S. Carr, and James A. Gray-saved the school. A new president, the Yale-educated John F. Crowell, improved the curriculum and, more important, conceived the idea of moving the college from its isolated, rural setting to a more vibrant, urban location. With key support from Washington Duke and fellow Methodist and townsman Julian S. Carr, Trinity College moved to Durham, opening there in 1892. The Duke family continued its commitment to the institution, and in 1896, when Washington Duke offered to give the college $100,000 for endowment if it would admit women on an "equal footing" with men, the college promptly accepted the offer, making Trinity a pioneer in the South in women's education. 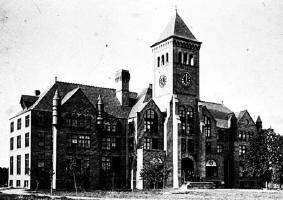 With steady financial support from the Duke family and a growing reputation for quality, Trinity had become by the time of World War I one of the stronger liberal arts colleges in the South. Soon after the war, President William P. Few revived earlier dreams of making Trinity a university. With the help of Benjamin N. Duke and others, Few approached the wealthiest member of the family, James B. Duke, with the idea. J. B. Duke's establishment of the Duke Endowment in 1924 gave Few the funds to achieve his goal. Trinity thus became and remained what Few conceived of as the liberal arts "heart" of Duke University. Nora C. Chaffin, Trinity College, 1839-1892: The Beginnings of Duke University (1950). Earl W. Porter, Trinity and Duke, 1892-1924: Foundations of Duke University (1964). "Trinity College- "Old Main," the Washington Duke Building". Photo courtesy of the Duke University Archives. Available from http://library.duke.edu/uarchives/history/histnotes/move_to_durham.html (accessed May 3, 2012). I'm interested in finding information on an academy that was in Olin, NC. The name was Olin Academy and/or New Institute. I've heard all my life that this academy was moved, by 1 vote, and became Trinity College, then Duke. My interest in this is because I grew up and now live in an old house that supposedly was a dorm for students at this academy. The original part of the house is perfect for dorm rooms, 2 long rooms on the 1st floor and 2 more upstairs exactly like the first floor, with fireplaces in each room. Several years ago when I-77 was coming through the back of the farm, a house plan was drawn up and estimated that the house was built in the 1840's. I would certainly appreciate any help you can give me on how to research this, or any information you might have. Thank you. Thank you for visiting NCpedia and for sharing your research interest. I am forwarding your question to reference services at the NC Government & Heritage Library. A reference librarian will contact you shortly to help you. Hi; I collect Confederate stamps/postal history. I recently obtained a cover (stamped envelope) addressed to a Miss Aurilia W. Hooper, Blackwell, Caswell Co, N.C. This is with an unusual cancel of "Trinity Colloge, N.C. Nov. 3." Do you have any info on the cancel or the addressee it would be greatly appreceated. Thank you for visiting NCpedia and for sharing your artifact and question. Unfortunately, NCpedia does not have anything that would help with this. If you have access to a local public library that has a subscription to Ancestry.com, you may want to try searching for Miss Hooper there. Also, it’s worth a try contacting the Caswell County Historical Association – they may have some helpful information: http://www.rootsweb.ancestry.com/~ncccha/.